Balthazar Bakery located in 80 Spring Street (near Crosby St.) in SoHo. It’s a popular place for all things French since it created a huge buzz back five to ten years ago. I never ate in their restaurant but I went to their bakery a few times before. 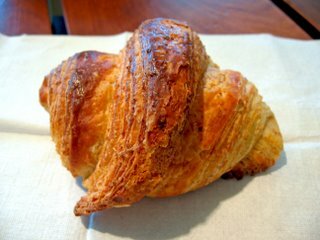 I tried their Almond Croissant ($2.50) a few hours after I bought it. I know, moisture and humidity might’ve killed the texture of the croissant a bit but I found the croissant in general, quite bread-like in texture. It’s not crispy, it lacked the shatter effect but it had a little bit of flakiness. It tasted good though; a sweet (a bit too sweet) almond paste filling in the center and it’s not greasy. Rating: 2.7 out of 4. It would’ve been a close 3, if it was crisper. Joyce Bakeshop at 646 Vanderbilt Ave., in Park Slope, Brooklyn. If you’ve read from my previous post about this bakery’s macarons, I had a slightly negative review on those macarons. 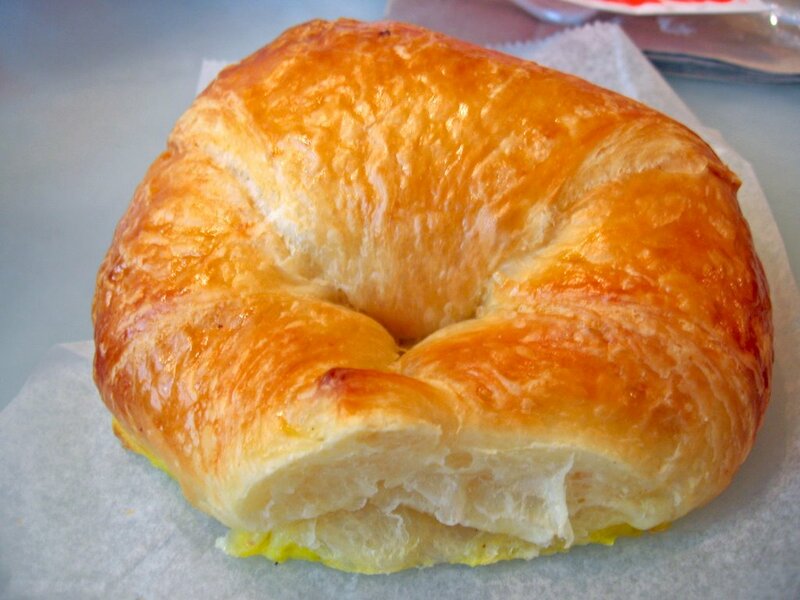 When it came to their plain croissant ($2) it didn’t really do any better. 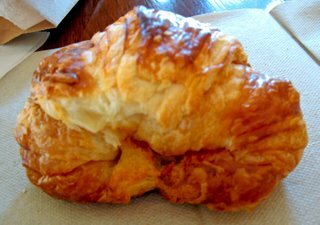 The positive part: the croissant was a bit flaky and I heard the crisp shatter from biting it. 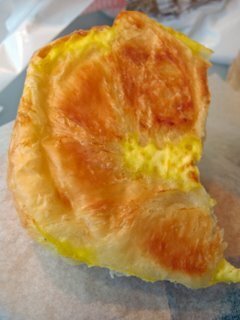 The negative: it was quite greasy and the flavor was bordering bland – the butter flavor of the pastry is not shining through here. It’s ok, not the greatest and not the worst. Rating: 2.5 out of 4. 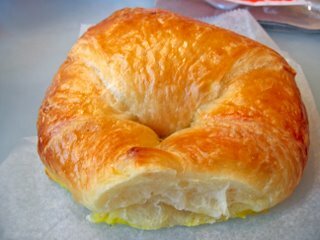 Tisserie at 857 Broadway (at 17th St) was the next destination for a plain croissant ($2). I didn’t really have high expectations for this place on croissants because it’s not a French bakery. It’s actually Venezuelan with a French influence. Their croissant looks decent but a bit too narrow than a typical croissant. 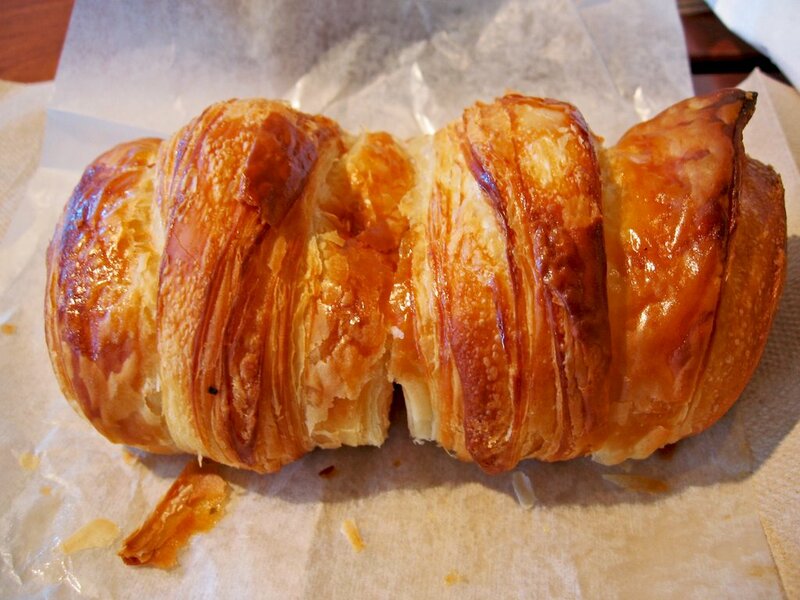 The croissant was really crisp but there’s no shatter effect that didn’t result much flakiness when I tore it apart. It doesn’t have a real buttery flavor, it’s not bland per se, but it’s not flavorful either. Rating: 2 out of 4. 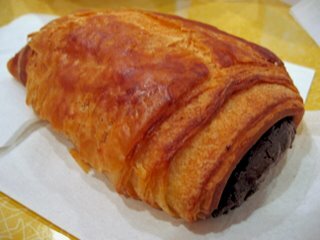 I have recently visited Patisserie Claude again but this time I tried his pan au chocolate, a.k.a. chocolate croissant ($1.85) at 7:30 AM. It was filled with a lot of loyal, local patrons who already occupied the tables which was unexpected to me (kind of). But anyways, it was fresh out of the oven and Mr. Claude was actually doing the transactions (he was actually nice). I walked over to Joe’s coffee on Waverly Place (a few blocks away) and ate it with their house coffee. The croissant was still warm. As you can see in the photos, the dark chocolate is still gooey (about 70% cocoa content). 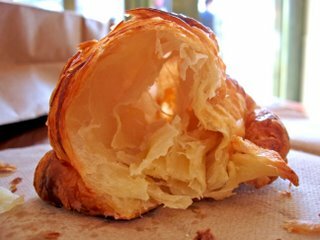 The croissant does not have much the shatter effect compared to the plain, probably it’s too warm? It was particularly greasy – as you can see at the photo, which was the biggest pitfall; at least it was still delicious. Rating: 3 out of 4. Panya Bakery located at 10 Stuyvesant St. (3rd Ave. & E 9th St) in the East Village; I’ve been to this Japanese bakery before a year ago and I remembered some of their stuff was pretty good but I haven’t tried their croissants before. So, my curiosity came over and I went down there to try their croissants, well at least two of their nine varieties of both sweet and savory. The first one I tried was their mini whole wheat croissant (60 cents). Isn’t it adorable? It’s about snack size, 2 to 3 inches in length. It has good color, it smelled wholesome yet it had a sinfully buttery scent, too. It was really crisp and had great shatter effect. There’s just a slight hint of grease on the fingertips but really unnoticeable until you really look at it. The flavor of the whole wheat gives it a slight nutty essence and the butter flavor really permeates throughout the crumb. It’s actually one of the better whole wheat croissants I’ve eaten in a long time. Panya Bakery located at 10 Stuyvesant St. (3rd Ave. & E 9th St) in the East Village; I’ve been to this Japanese bakery before a year ago and I remembered some of their stuff was pretty good but I haven’t tried their croissants before. So, my curiosity came over and I went down there to try their croissants, well at least two of their nine varieties of both sweet and savory. r really permeates throughout the crumb. It’s actually one of the better whole wheat croissants I’ve eaten in a long time. Rating: 3.2 out of 4. 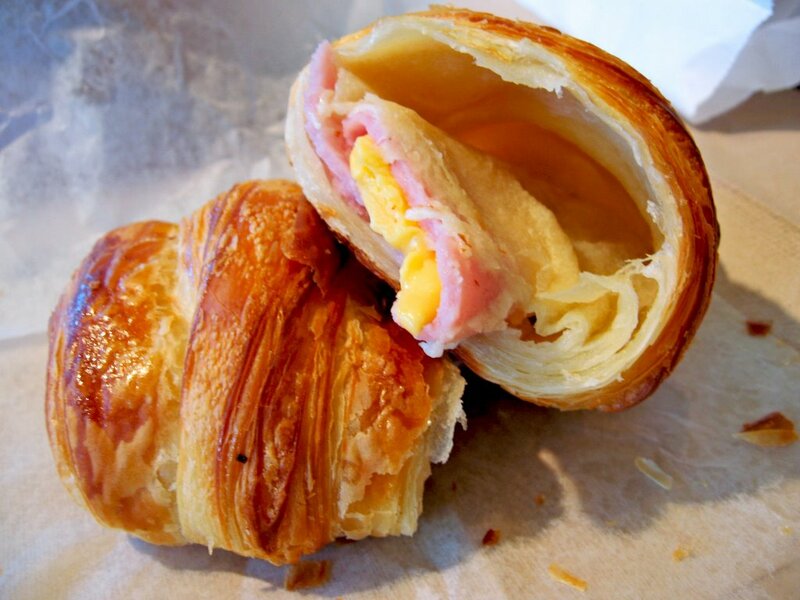 The other croissant I had from Panya was their ham & cheese croissant ($2). It had a gorgeous lacquered, golden brown exterior and it smelled of butter. It was very crisp and it had good shatter effect. I forgot to use a knife to cut the darn thing so that explains why the ham and cheese is dangling out of one of the halves. Anyways, the ham was the regular ham you would get from a deli and the cheese was American cheese from a deli as well. I wouldn’t expect fresh baked ham and Keen’s cheddar (an English cheddar – very good by the way) in it since it’s $2. But it’s yummy and not particularly greasy. It’s good breakfast food for those who don’t have sweet tooths; not everyday of course unless you want to raise your cholesterol. Rating: 3 out of 4. One of the commenters from my previous post on croissants claimed that Zabar’s located at 2245 Broadway (80th Street) in the Upper West Side, was good. I ventured there for breakfast before my morning class, since John Jay is actually not too far from there, and gave their plain croissant a whirl (cost $1.65). 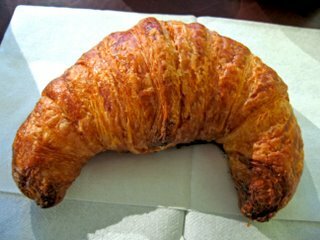 The croissant looked good: the shape was fine, it had a decent, light golden brown color and a slight sheen from the glaze. However, it was was not crisp and it does not have any shatter when I teared it in half. Disappointment…the interior looked ok, a lot of irregular holes which kind of reminds me of bread – not really a good thing to look for in a croissant. 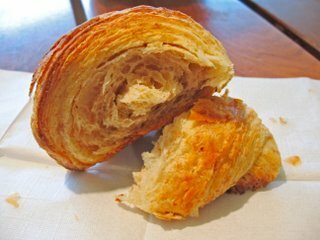 This means that the croissant’s texture is going to be more soft and bread-like than crisp, flaky lightness that I seek in a great croissant. When it comes to taste, it has a very vague hint of butter flavor not much of going on. To sum it up, it’s soft, light and slightly moist in the center. The egg glaze probably is the reason why it’s soft on the exterior (as you can see on the bottom of the croissant); it gives a nice golden brown color but no crispness to any baked good as I have done this for many years on my homemade baked soft white bread loaves. Not the best croissant I’ve ever eaten. But at least their coffee was not bad; they just added a little too much milk in my coffee. Rating: 2.5 out of 4. Almondine Bakery located at 85 Water St. in Dumbo, Brooklyn. I have been to this bakery when it first opened – yeah, it was a loong time ago and I remembered it was one of the superb bakeries in the city. So I thought I should repay a visit and try some of their baked goods. It was around 8 AM when I arrived there and they had a couple of baked goods out like the croissants, a couple of danishes, creme brulee, cupcakes and their highly rated baguettes from the NY Magazine article that was out recently. I tried their plain butter croissant ($1.95), amongst the other goods. It was slightly warm and very crisp – the slightest touch to the croissant, you can hear it’s brittle song. When I tore it in half, it shattered and flaked. Not at all greasy and it had a wonderful buttery scent. Mm…I was sensing delirium’s coming to me once I take a bite out this croissant. The taste was very ethereal – it’s buttery good and it has a great mouthfeel to it – it’s light and delicate. I love this croissant. 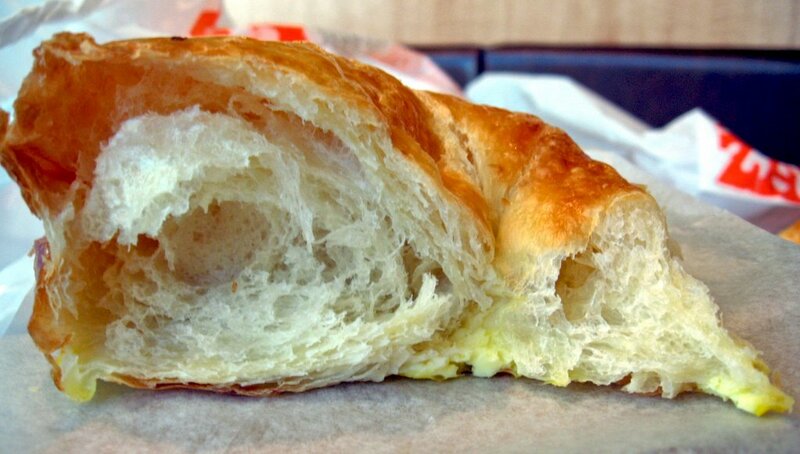 It’s the closest to perfection for a croissant in my book! Rating: 3.75 out of 4. So, as you can see I love Almondine’s croissant. 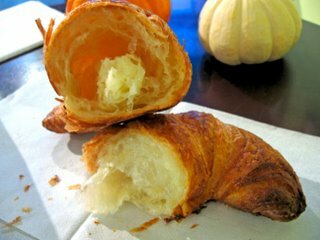 So go out to Dumbo, Brooklyn and get some of their croissants (and pastries)! I finally went back to La Bergamote after a long absence from this place for half a year and I tried their chocolate croissant ($2.45? I don’t recall exactly how much I paid for it but it’s around that price). It’s very crisp, flaky, buttery, and has the shatter effect from biting it. The croissant has good dark bittersweet chocolate, about 70% cocoa. It’s very good. Rating: 3.3 out of 4. “Isn’t it a thing of beauty? Perfectly golden brown exterior, buttery aroma, it has the crisp shatter effect from the slightest pressure. Oh, I’m getting excited! (Hey, I love food. If you don’t have any feelings for food, you don’t love food; you’re just eating for the sake of eating. One must appreciate the effort those bakers/chefs/cooks put into their product and if it’s good and exquisite, then it’s worth loving the product, the baker/chef/cook, and possibly the institution of where you bought that product). thick broken glass, with the fall of thin, delicate shards of it’s flaky exterior. The moment I bite into the croissant, it had the shatter at the bite and it was actually very light in texture. I’m delightfully surprised because the woman I spoke to said it was dense. Hmm…anyways, it was (as I said) light, delicate and it had the faint creamy hint of butter flavor. I have to say this is one of the best croissants I’ve ever eaten in my entire life! J’adore! C’est magnifique!“ Rating: 3.75 out of 4. The last and final croissant (not their coronetti) was from Taralucci i Vino; cost $1.50 with tax comes out to $1.65. It’s very crisp and flaky to the touch with a tiny bit of shatter effect. I should consider the fact that I bought and ate this croissant at 11:45 AM, I’m not expecting perfection but it’s not bad really. It tasted buttery – good butter flavor, not stale at all. Rating: 3 out of 4. If you want to see the album of all the croissants I’ve consumed for the previous and current post, click here. Just click on the Slideshow on the top right corner. If you would like to see a map of all these places, click here. 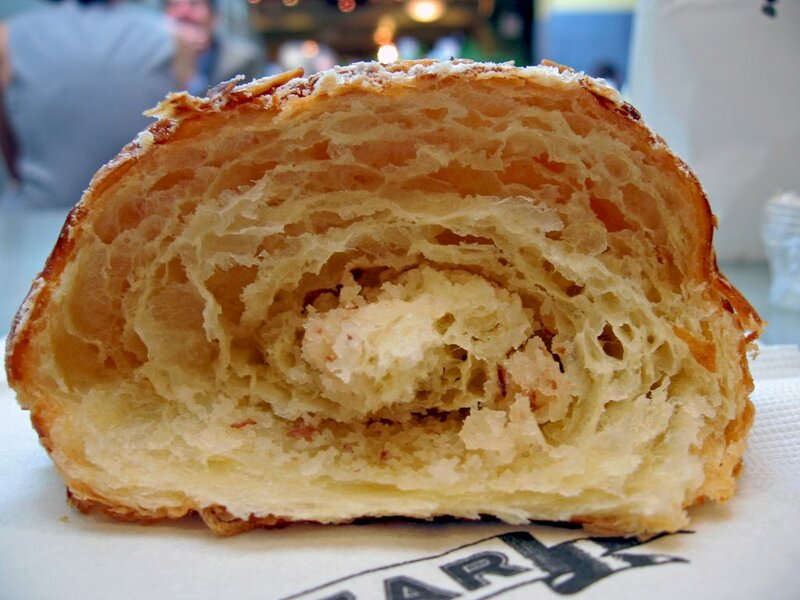 If you want to read the first part of this search for great croissants, click here. There’s a new French patisserie in Astoria, called Le petit Prince on Broadway between 33rd and 34th streets. I am now motivated to try their croissant! I’ll report back if there’s any good news but thanks VERY MUCH! this was a fun read. Carol – Thanks for reading this post! 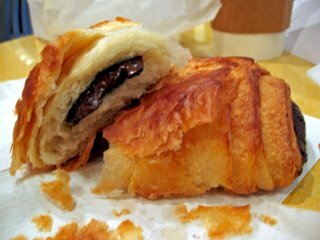 If you happen to find a great croissant anywhere in NYC, please do report back! what? no Ceci Cela on Spring? La Bergamote is my fave, but I’ll have to try Almondine.